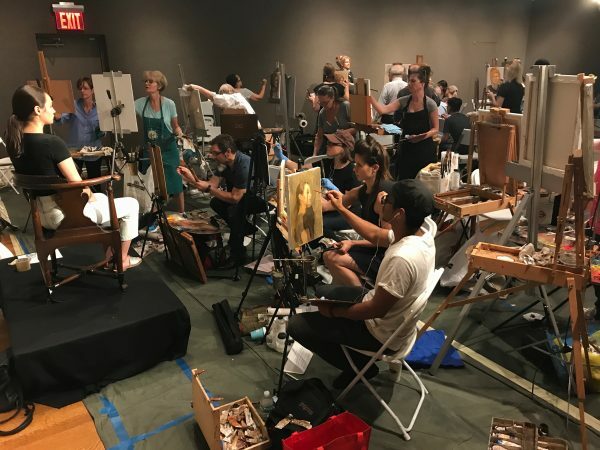 NEW YORK—The smell of oil paint filled the room. 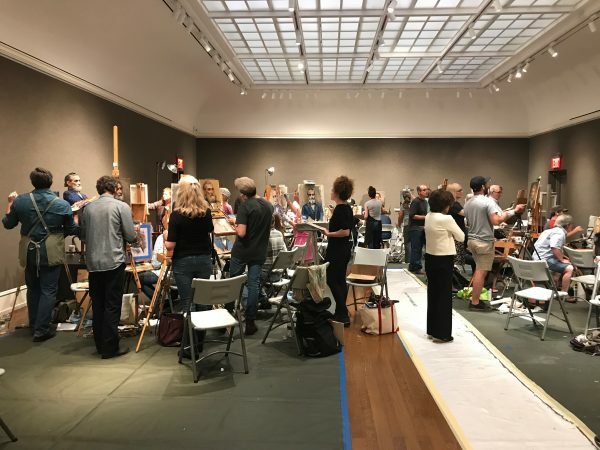 It was so quiet, you could hear the rustle of paintbrushes as 40 artists painted shoulder to shoulder in the main gallery of the Salmagundi Club. 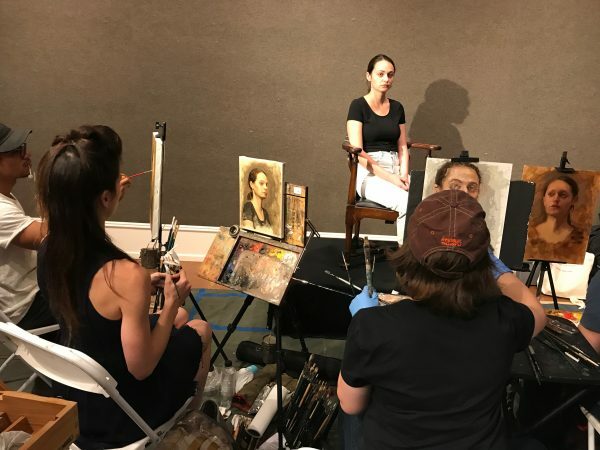 Despite the merits of art competitions, the Oil Portrait Sketching Competition on Aug. 26 was the first of its kind held by the Salmagundi in its 146-year history. This year marks the 100th year anniversary of the club’s permanent home in the historic brownstone nestled in New York City’s Greenwich Village. “I believe this is going to become a regular event. It is so exciting,” said the first vice president of Salmagundi, Elizabeth Spencer, before announcing the winners. “It’s going to be a great centennial—event after event. This is No. 1, and it is fantastic!” she said, beaming, as the artists applauded and cheered. 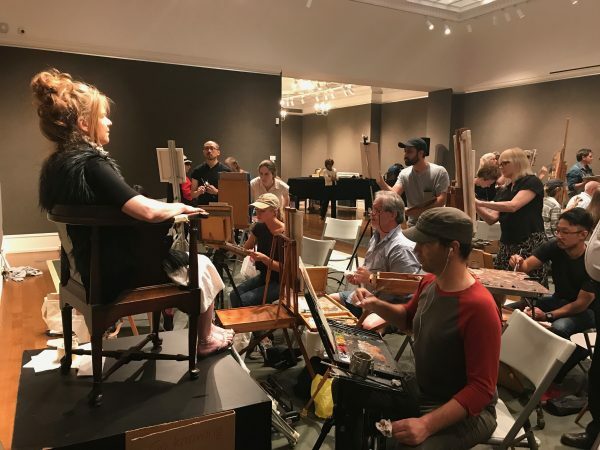 The Salmagundi Club is the second-oldest art organization in the country and one of the most active. 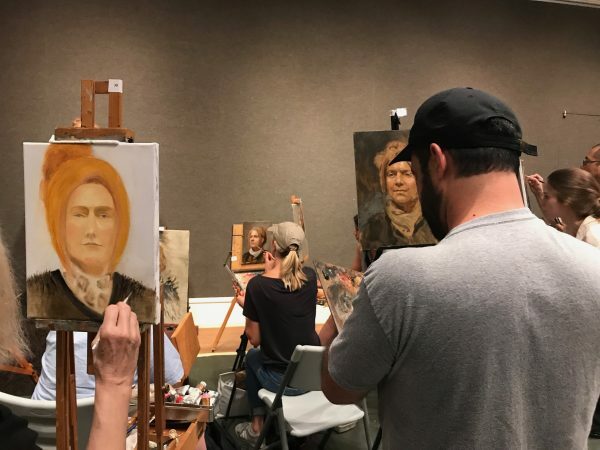 The portrait competition elevated its liveliness up several notches. “Competitions are fun, but really, I was looking forward to the social aspect of it—the camaraderie, peeking over and seeing how other people would be solving the same problems that I would be solving, in completely different ways,” said Gregory Mortenson, who won the second prize of $500. Mortenson registered for the competition at the last minute. He didn’t even think he would make the first cut. “You can never go in expecting to win,” Mortenson said. “I’ve judged competitions, and it is hard. You are faced with so many good paintings,” he added. 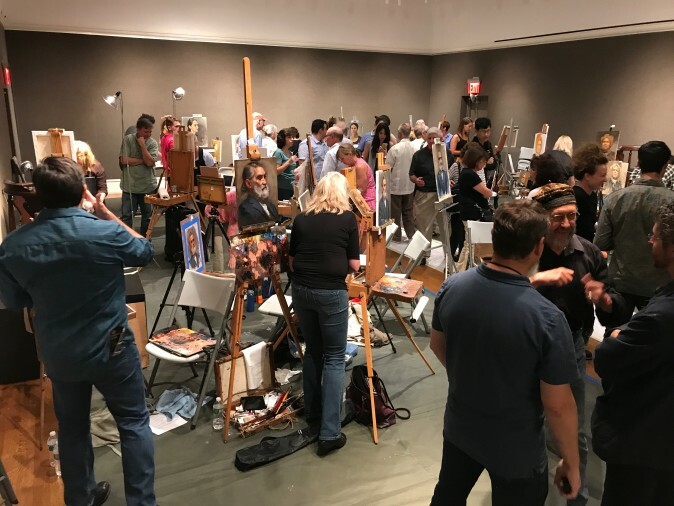 The judges quickly selected the top eight paintings, without debate, eliminating any paintings that were not as well executed in terms of technique. The second cut, down to five paintings, took longer to decide. There are standards by which to judge a work of art, but in the final decision, taste takes over. 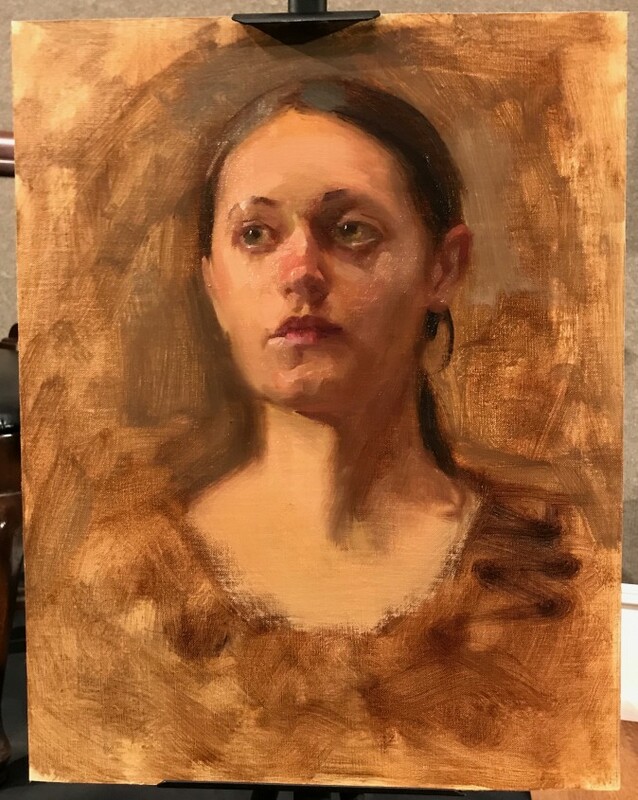 Katlan encouraged the judges to evaluate the oil portrait sketches based on several criteria: representing proportions convincingly, understanding facial structure, modeling the lights and darks consistently, and observing the light effect correctly. The two winners were selected based on those criteria as well as, most importantly, their overall artistic strength. 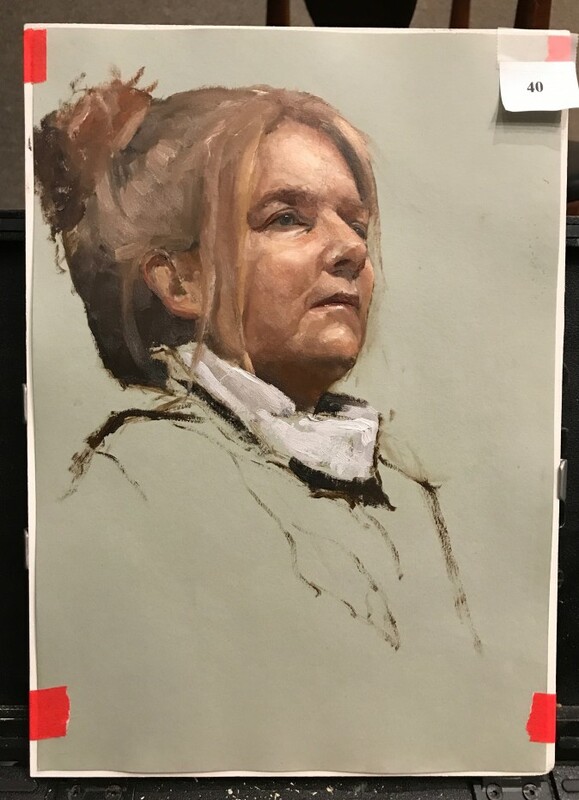 As Mortenson was being interviewed for this article, his oil painting sketch had already been sold to another artist, raising his monetary award that day higher than the first-prize winner, Richard Piloco, who received $1,000. It was not quantifiable how much his spot in front of the model may have given him an advantage. “There were certain things that I did when setting up to paint and recognizing how much light was on the model’s face. I was making decisions right from the start on how I wouldn’t want it to be, and I tried to paint that idea rather than directly paint what I saw,” he said. Piloco then signed his painting, which will be added to the Salmagundi’s permanent art collection of about 1,500 works. He was surprised he had won. The idea of competing doesn’t come naturally to Piloco, as he spends endless hours alone in his studio. The artists mingled long after the winners were announced. Greetings, smiles, and chatting filled the main gallery, and gradually trickled away as the artists left and continued their conversations on the stoop of the historic Salmagundi brownstone, mentioning how much they enjoyed the event. 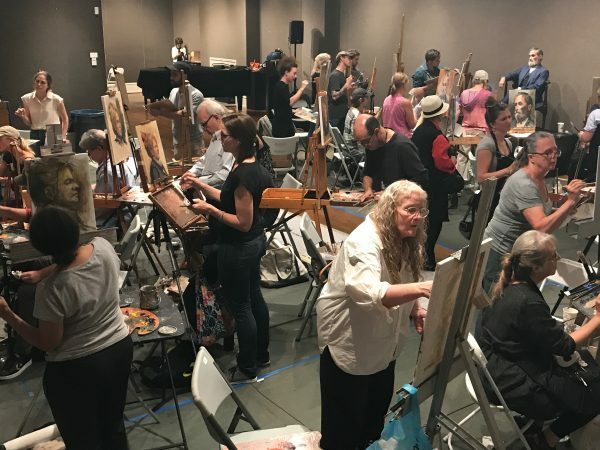 While painting competitions are much about camaraderie, especially among artists who create representationally, they also encourage artists to hone their skills and to develop their artistry. Such competitions remind us that there are standards by which to judge works of art. These are generally agreed upon. 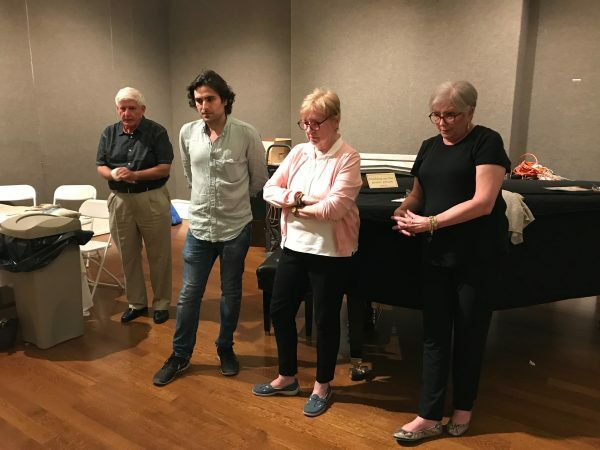 In violin or piano competitions, for example, the judges can tell if the musician is playing the notes on the score properly and how well they are interpreting the music. 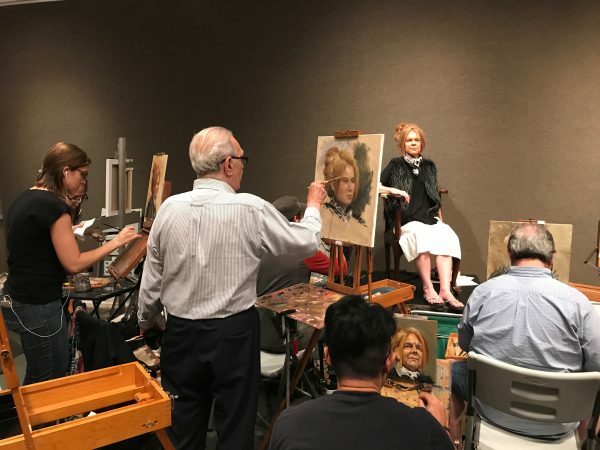 Similarly, in painting competitions the judges can tell how well the artist has captured the likeness of the model, how well the flesh tones are represented, how well the image is composed within the frame, and how refined the artist’s hand is, visible in the paint strokes, and so forth. 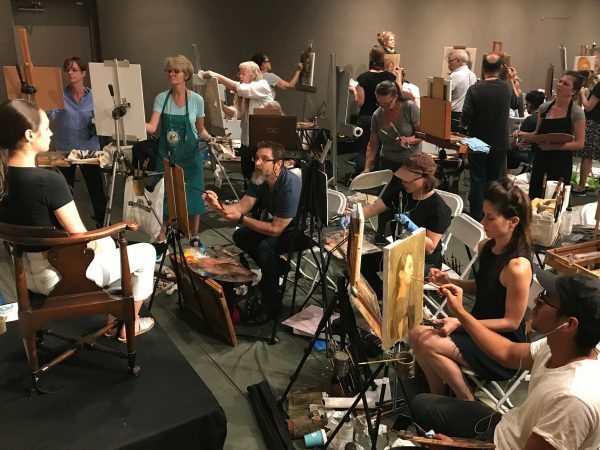 During the Still Life Competion that took place in August at the Grand Central Atelier (GCA), the stakes were higher: the prize was more ($10,000 for first prize, $3,000 for second, and $2,000 for third), the competition was longer (five days), and the judging took longer and was probably more discerning. 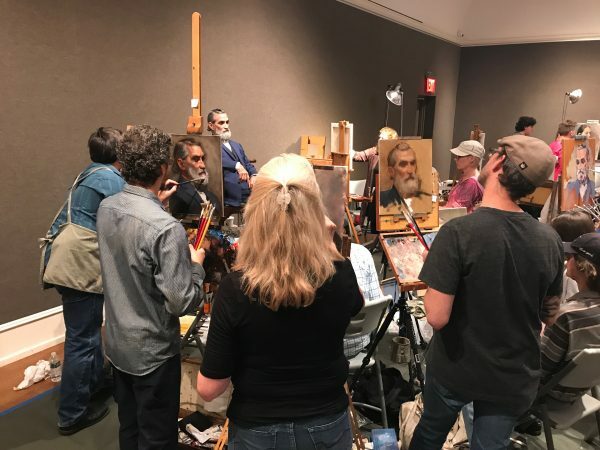 The GCA judges returned to each painting several times, comparing each to their respective setup. 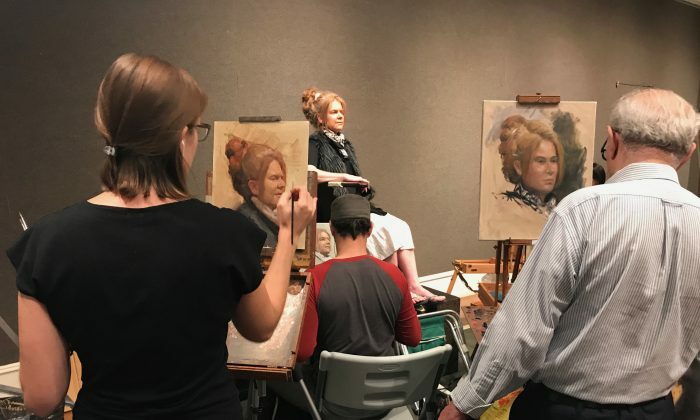 Then they evaluated the works based on the drawing, composition, perspective, light effect, and paint quality, as well as their aesthetic values in the classical still life tradition, the GCA website stated. 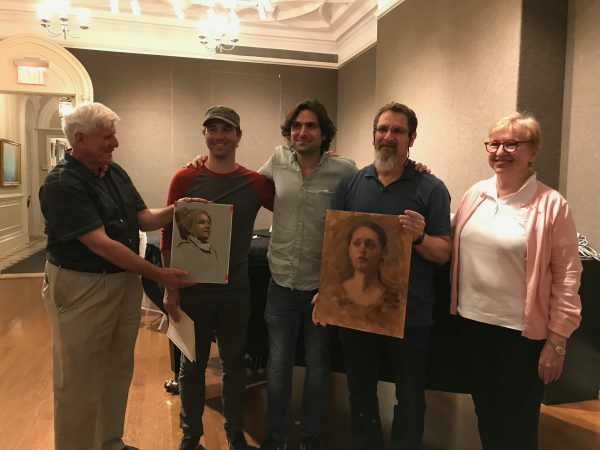 For hosting organizations like the Salmagundi Club, part of the incentive of holding art competitions is to enrich the representational art tradition. The portrait sketch competition was a first. The judges and the organizer mentioned that they might raise the bar next year by selecting the participants instead of inviting artists to sign up on a “first come, first served” basis.